This post is part one in a series of three from Lisa at Organize 365. She’ll be focusing on ways to organize your kitchen this month and I hope you come back each week to read more and then visit her blog to find ways to organize your entire home. Did you know there are seven or more different kinds of paper floating around your kitchen? No wonder you can never find “that” paper that you’re looking for! Hi! 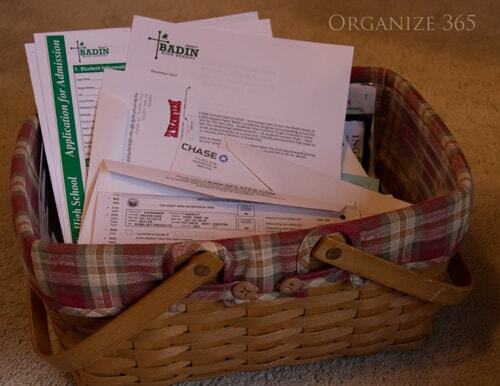 I’m professional organizer Lisa Woodruff, and I’m here to help you get that paperwork organized. The easiest way to tackle the paper monster is to literally put every single piece of paper that you can find in your kitchen into one or more laundry baskets. Yes, I know your laundry basket will be overflowing, you will be sweating and this mountain of paper looks just too big to tackle in one session alone, but you can do it! I like using laundry baskets because you can move the baskets into a different location. Often there is not enough room in the kitchen to really sort and organize the paper that you need to store there. Even in this “paperless” society, we live with lots and lots of paper. So let’s take a look at what is in that laundry basket. 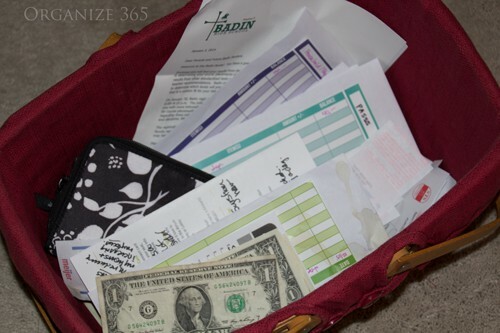 Even if you have a home office, the bills and mail often tend to collect in the kitchen. The most efficient organizational method is to actually shred and recycle everything out of the mail as you bring it in the house. Sometimes I can’t do that right away, and so my mail pile will stack up. Having a pile of mail is not a problem; as a matter of fact, you’re going to need a pile of bills that need to be paid. So, go ahead and designate a part of your kitchen counter and a basket or a file for this kind of paper. 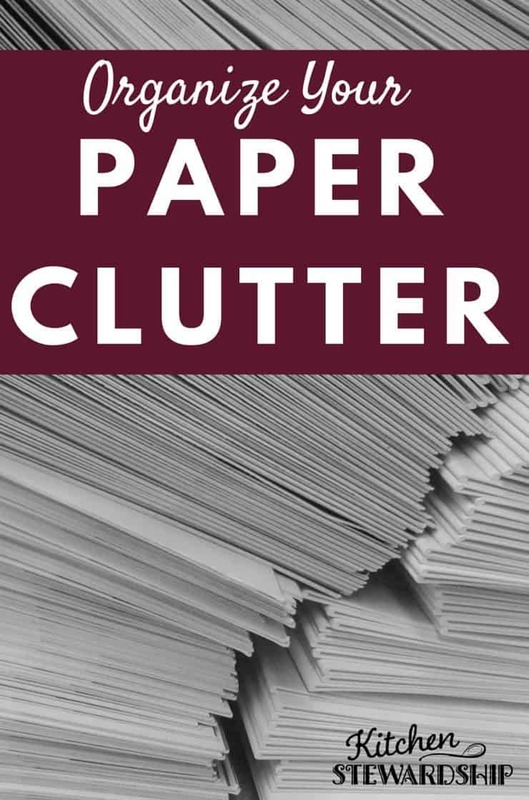 As you open the mail or kids bring things home from school, you will find some papers that you need to put into a long-term filing system to retrieve “when you need them.” Separate these papers out from the bill/mail pile right away so that you don’t touch them multiple times. There are different ways to handle your “to file” papers. Your first option is to actually take them wherever you have your filing system and file them right when you receive them. Often, time will get away from us and these papers tend to pile up. In that case you have two options. The first is to move some of your most frequently used files actually into the kitchen. 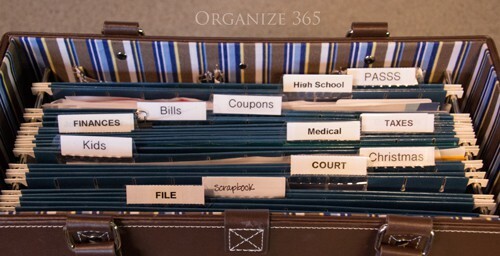 The other option is to create a file that you put “to be filed” papers in, or hang a plastic file office file organizer on the landing to your basement stairs to place items to be filed and file them quarterly. 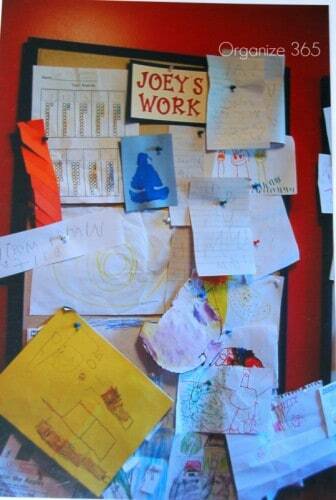 We love to display our kids’ artwork in our kitchens. The problem comes when we have more artwork than we have walls to display it. I often am not ready to get rid of my kids’ artwork after it’s been displayed only a few weeks. I solved this problem by creating bulletin boards for each of my children when they entered preschool. That way, I could put up all their artwork from the month and take a picture at the end of the month. That picture ended up going in their scrapbook at the end of the year, while the artwork went into a box. Over the summer, I was able to cull the artwork down to just a few special pieces I wanted to keep and create a scrapbook page of all their artwork in their albums. In addition to kids’ artwork, you will also receive school papers that they have completed during class time or homework that has been returned that is graded. These are not papers that I tend to put on my refrigerator, but I do hold onto them for the calendar year. I have designated one box for each of my children to store their schoolwork in…right in my kitchen. There are a few reasons why you might want to hang onto your kids’ school work for the current school year. First, you can use the schoolwork when you are questioning a child’s grade in the subject. Schoolwork is also helpful if you need to fight for your child’s IEP (Individualized Education Plan) based on their special needs. Finally, I like to keep a few pieces from each school year in a binder for my children to look back on. I choose these pieces at the end of the year after I see everything that they have brought home. I have always been a work-from-home mom. One of the most important kinds of papers that tends to get lost in the sea of kitchen paper is our money, in gift cards and checks. I have a small special basket that hangs on the wall. Whenever money, checks or gift cards come to our house, they go straight into the basket. Then, when I am heading out to the bank, I take any checks that need to be deposited. I don’t think the electronic age has reached the elementary school system yet. Even schools that do not send everything home in paper form send a lot of emails that need to be printed out and put on our kitchen refrigerator so we “don’t forget.” Keeping track of my kids’ special days, lunch orders, field trips and school schedules can make me crazy. A few years ago, I came up with a solution called that I call the one clip. Each of my kids has one magnetic clip on my refrigerator. 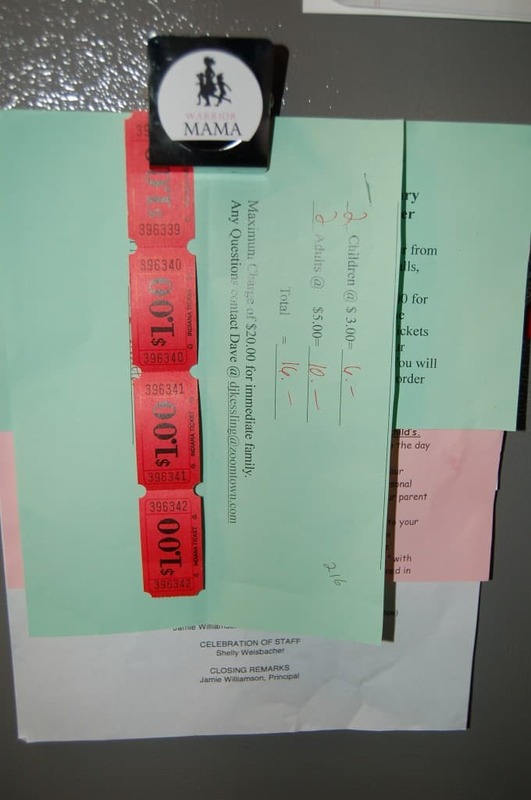 As school fliers come home or are printed out, I highlight the necessary information so that I can glance at a flier quickly and see the amount due, the time that it’s due and anything else I need to do for that special event. Then, I add that piece of paper to that child’s one clip on my refrigerator in chronological order. Every morning, I look at the one clips to see what the top paper says. Since only the next event is on the top of the stack, that is all I have to look at that day. By stacking the papers this way, I know that I won’t miss the deadline, and my kids will have everything that they need. But my mental energy is not spent looking at a lot of fliers on my refrigerator and trying to remember dates far into the future. Now that my children are in separate schools, it is even more important to know what is going on with which school at what time. Now that all of your paperwork is sorted into these six different piles and your systems are started, you need a way to keep them maintained. In a perfect world, any paper that comes into your house would be immediately acted upon and put into the proper system. But this isn’t a perfect world. 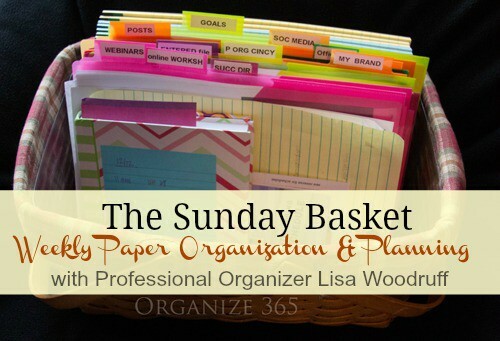 This Sunday Basket is a system that I created when my children were babies. Even the most organized among us can be taken out at the knees by sleep deprivation. We pack our days to overflowing with the things that make us the moms that we are. And those moms often have piles of paper in their kitchens. So, instead of continually stressing out day after day about the paper accumulating on my kitchen counter, I decided to put it into a basket. Then, every Sunday night, I would empty everything out of the basket, look at all the different pieces of paper, put them where they needed to go and start fresh on Monday morning. I hope that these seven tips help to get your kitchen paperwork under control and organized! Katie here – If you are looking for more tips on getting organized this fall, be sure to check out the Organizing in October series I worked through a while back. Once Lisa’s series is complete you’ll be able to find every post with a single click: Kitchen Organizing with Lisa. What systems do you currently have in place? Will you be able to utilize these ideas in your own kitchen? Lisa Woodruff shares her organizational tips, her entrepreneurial spirit and humor to encourage other moms on her blog Organize 365. Organization is all about making your time and your space fit YOUR priorities. 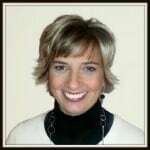 Lisa’s ebooks including 10 Steps to Organized Paper and printables are available on Etsy. Disclosure: There may be affiliate links in this post from which I will earn some commission if you make a purchase. See my full disclosure statement here. Good for you!! I do SO much in my kitchen that the paper tends to stack there. I also find many homes do not have a designated home office. Ibet you enjoy yours! Thank you for such a detailed post! 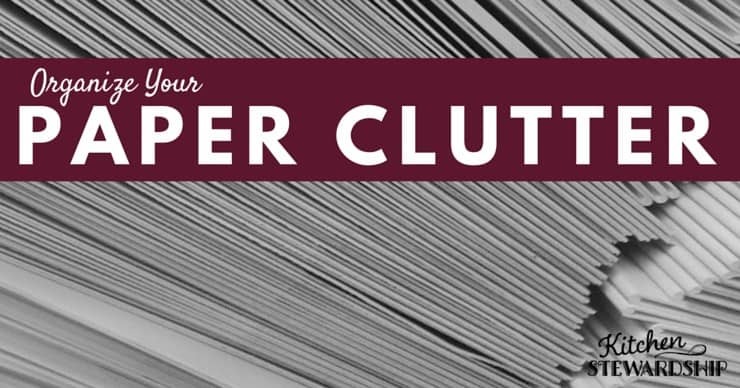 I am always working on handling paper clutter! This is great. 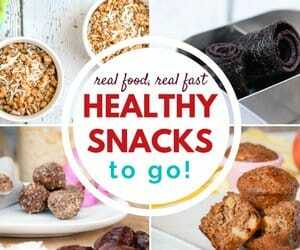 Will definitely be implementing some of these strategies. Paper definitely takes time to get under control! I am always looking for more ways to organize my paper! AHHHHHHH! We just started homeschooling two weeks ago and, between kid artwork and kid school work, I feel like I want to hyperventilate when I see my kids’ bulletin board spaces! Taking a picture of the collage is a great idea. I feel like I’m keeping up with all the other categories well… except #3 (*hyperventilates again*). I can’t wait to read future posts! I have to say I am a BIG recycler and “pitcher” when it comes to kids school papers just like Katie. The bulletin board was my “boundary” for how much stuff I would display each month. If it didn’t fit – I pitched it. Simplify,simplify simplfy…that is my mantra. Paperwork is on my mind …I thought this was a great article. For myself I have a draw in a kitchen cabinet designated for bills.And a draw for notebooks. I keep a notebook with page protectors for recipes, another notebook for all my banking paperwork ,and a last notebook to hold all the guides for my kitchen gadgets.In my closet is a filing cabinet with two draws. It holds files for doctors, bills that have been paid, and extras. After reading this article I have decided I need to consolidate everything to one area. I will be going through everything and releasing half of all I have in these storage areas to my favorite organizing tool…the trash barrel. Thank you for the inspiration today. Kate that is AWESOME! I myself have been simplifying for the past 4 years. I am down to very little paper, but it was a longgggg time coming! Great ideas. I have my office upstairs, but with no central heat and air in Texas, I don’t go up there in the summer to file paperwork. Each year for the past several years, I have purchased a spiral bound bill manager from Dollar General. It keeps bills, pay stubs, etc. neatly organized. Also, I put any receipts that would apply to taxes in the December section of that the bill manager as I always begin my taxes in January. It works like a charm. When I was a Girl Scout leader, I also purchased one of the bill managers for that in order to keep the receipts organized. It worked quite well. I don’t have kids and most of the drawings I get from my niece and nephew go in my office. They aren’t local so it’s usually only a few drawings every few months when they visit. What I DO need is a better system for organizing my paper, when I was cleaning out the house I found so much stuff to shred, we shredded off an on for a week (and kept burning out the shredder) and still ended up with two boxes full of ‘to be shredded’ stuff! Anyone have suggestions for where to take it when you end up with that much? Check with your village hall – I know ours has annual “shred days” where a service comes that shreds them on-site in a truck. Some office supply stores do that as well, either by # of boxes or by weight. I use the “kids bins” for both school work and art work. We go through them together at Christmas break and summer. It’s was a lot easier to get my 4 year old to part with his paintings when we put a whole year’s worth in a pile and asked him to pick his 3 favorite. So much simpler than trying ot get him to recycle stuff right after it was created!